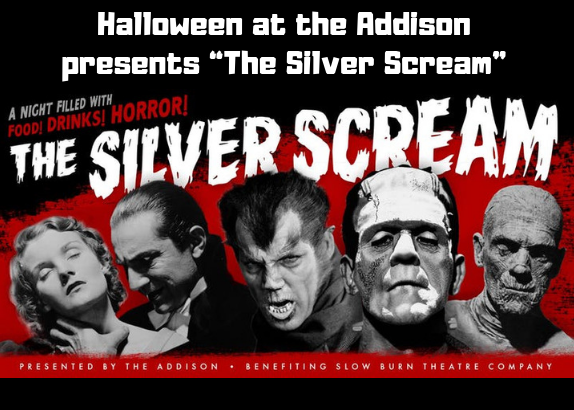 Halloween at the Addison presents “The Silver Scream”. DISCOUNT TICKETS $110 EARLY BIRD (OFFER ENDS SEPTEMBER 30, 2018). WHAT: Voted “Event of the Year” by Boca Magazine, Halloween at the Addison is back! Five Star Diamond Award winning event venue and Boca Raton landmark the Addison is opening its doors to the public on Halloween night for a unique and over-the-top event experience to benefit Slow Burn Theatre Company at the Broward Center for the Performing Arts. Complementing the Addison’s historic property, this year’s theme pays homage to the 1930’s classic horror icons: Dracula, Frankenstein, the Werewolf of London, and the Mummy. The party will feature extravagant event production (with a haunted walk-through and themed rooms) sponsored by Daniel Events, live music and entertainment by Custom DJs and Celebrity Entertainment, foodie-approved fare catered by the Addison, and an open bar with specialty craft cocktails. Boca Magazine will be this year’s Exclusive Magazine Sponsor. Tickets and VIP tables are available at http://addisonhalloween.com. $2,500 VIP tables for up to 10 guests (limited availability) – includes complimentary valet parking, access to indoor VIP area, table-side food & beverage service, and champagne bottle service – in addition to General Admission benefits. Tickets include entry, food, open bar, and entertainment, and are non-refundable. Proof of age is required for alcohol consumption. This is a rain or shine event. The Addison is a Five Star Diamond award-winning event venue, caterer, and historical landmark located in Boca Raton, Florida. Built by famed architect Addison Mizner in 1926 as an example of his architectural vision for Boca, the Addison is now one of the most popular private event venues, specializing in weddings, celebrations, corporate functions, off-premise catering, and glatt kosher events. For more information, visit http://theaddison.com or call (561) 372-0568. The Broward Center for the Performing Arts is one of America’s premier performing arts venues. Presenting more than 700 performances each year to more than 700,000 patrons, the Center showcases a wide range of exciting cultural programming and events, and offers one of the largest arts-in-education programs in the United States, serving more than 150,000 students annually. The Broward Performing Arts Foundation, Inc. receives and maintains funds to sustain, develop and secure the future of the Broward Center. The Broward Center for the Performing Arts is located in the Riverwalk Arts & Entertainment District at 201 SW Fifth Ave. in Fort Lauderdale. For more information, visit BrowardCenter.org.